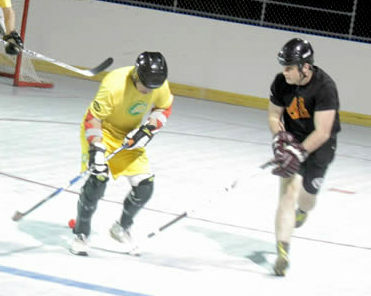 The Bermuda Ball Hockey League season resumed at the PCC Hockey Rink with a double header that produced 10 goals. Early in the evening members of the Bermuda Ball Hockey organization hosted the Beyond Rugby youth program for an evening of Ball Hockey. The evening included ball handling and skill oriented drills with several members of the ball hockey association in attendance as well as members of the Family Centre. In the opener the Rimouski Oceanic defeated Guelph Storm 3 – 2. The Rimouski Oceanic took a 2 – 0 lead in the First Period with goals off the sticks of Matthew Benson and Jeffrey Loper. The Guelph Storm pulled a goal back in the Second Period with a goal from Christopher Merritt. In the Third Period the Guelph Storm would draw level with a goal from Adrian Stromberg, but Josh Bush would score what proved to be the winner for the Rimouski Oceanic with little time left on the clock. In the nightcap the Red Deer Rebels edged the Calgary Hitmen 3 – 2. The Red Deer Rebels got two goals from Mathieu Desjardins and a single strike from Jeremy Estey, while the Calgary Hitmen got single strikes from Akhil Kapur and Ross Rufiange.